potentially nervous: please help...i have a question about fats in the comment section. bunny experts please go there and see if you have any idea what to do. thanks! please help...i have a question about fats in the comment section. bunny experts please go there and see if you have any idea what to do. thanks! ok so i was petting his little furry face. i felt a bump. when i cleared all his fur away from the little bump i saw that there was a big whisker growing out of the center of it and it had a white head just like a pimple or zit. i probably shouldn't have, but i tried to pop it and it bled a little bit. it did not pop however. it's still has a white hard center. i pulled the whisker out of it and it didn't seem to make a difference. do rabbits get ingrown hairs? i know they are prone to abscesses...is that what this is? if so what do i do about it. nuage had a huge one once and it needed surgery. this is a tiny little thing but i'm still very concerned as i know that the littlest thing can cause them not to eat and they get infections easily. i put hydrogen peroxide on it....is that ok? i'm at a loss i couldn't find anything on line. please please let me know what you think!! thanks!!! Never heard of it, nor seen it ... hope you get a good answer. Did you Google "bunny whisker bump" or some such thing? i googled ingrown hair and couldn't find anything. of course there is a bunch of stuff on abscesses but i'm not sure that's what it is. although when 'they' described how thick the mucous is of an abscess that seems about right since it didn't pop. another friend wrote to me and said it may not be ready to pop but it is so white and has come to such a perfect rounded head that it sure looks ready, but it's hard. thanks for your concern rabbit guy! I'd think it an abscess in the hair root personally. I wouldn't use Hydrogen Peroxide since it really dries out bunny skin and their skin is so very fragile. If you have a good vet, I'd swing by and get him/her to treat it. Otherwise, cut it open and squish it to drain it.. and then apply neosporin, the kind *without* antibiotics. I've had two abscesses with Monty, both were hard lumps but I took him to the vet before they got large enough to threaten popping. I did go through minor surgery to drain and clean it followed by weeks of antibiotics but I think that if it ever reappears I'm going to lance it myself. It seemed like the most helpful thing was to get a warm washcloth and use it as a compress to help open and drain everything... plus it made him much calmer! unfortunately a vet isn't an option right now!!! long story.....if you think i can do it please tell me how. cut it? with what? have you done this before? it's very small...i'm going to write to you on your blog too so that you can see my further questions but i've posted here also so that if anyone else has any feedback they see this. thanks hannah!! how would you lance it? the one nuage had was so big that it's hard to believe this little thing is one, but maybe? it's about the size of an engorged tick...what do you think? Start with things like warm wet washcloths and neosporin before you go poking anything. And if you do start poking, cutting, whatever, make sure you sterilize the pin/needle with alcohol before you touch it to Fats. The last thing you need is a real infection on top of the odd little bump! Quick story -- Ariel, years ago (like 6), had a bump kinda like what you describe on her, well, let's just say they were on her privates, poor thing. I took her to a vet at my parents' house (of course I wasn't near my vet at the time!) and the vet basically just prescribed some neosporin and said watch it. Three days later, it was gone. I'm not sure it matters whether the ointment has antibiotics in it or not. They wouldn't be ingesting it (esp. if it's on Fats' face). Don't use too much, but I don't think the ointment is a problem. Rabbit pus is thick, like toothpaste.. that seems to be in line with your description of it being hard to pop. If it is an abscess, there are different opinions on how it is to be treated. The more recent opinion is not to lance/open it, but rather to treat with a combination of antibiotics injections. If you're interested, I'll let you know where and who I got that information from. Hans used to get little lumps on his body. It happened twice. They looked like a little grape hanging off his body. I suspect there was pus in there but before the date of the vet appointment, the lumps had dried up on their own, turned into something similar to a scab and dropped off. So that kinda settled the problem for us. Now he has an abscess at the root of his teeth. He's getting oral antibiotics (Baytril). I've read that Baytril isn't effective against abscesses, but the vets here are reluctant to use stronger antibiotics :( We're still giving him the Baytril and we'll see how things go at the end of the Baytril course. Sorry, we're not much help here. Freckles hasn't had anything like that (nor did our previous rabbit, Clyde.) We're reading the comments with interest in case we have to deal with something like it in the future. Now that I know it's so tiny, I think it's probably just a sebaceous cyst (http://en.allexperts.com/q/Rabbits-703/Cyst-1.htm) which isn't such a big deal. I would use the warm wash cloth and a sterile pin/needle to poke around, use some sort of ointment to keep it from getting infected and then just keep an eye on it for a few days. I'm always surprised when things magically disappear on bun buns... if it keeps getting bigger or infected then you could take it to the vet and see. Is everything else okay - the way the bunny is acting? Does he appear to be in any pain? Thankfully when i get scary things like this i go to my great vet (gets expensive, but they are worth it). Although it sounds a lot like something two of my bunns have on their ears, sort of. Looks like a small pimple, sometimes with a head or not, doesn't seem to bother them too much, if i can get them to let me (they don't enjoy me messing with their ears) i can put some pressure on it and it sort of pops, with almost waxy stuff coming out, not so much like puss. Those the vet said were "just something that bunnies get." One she just used her finger to clear out, and another bigger one she said she could lance, but since it wasn't infected it would be best to leave alone. If there was an infection, i would most likely panic, as one bunny that passed had a jaw infection that got out of control. I hope Fats is okay, he seems like an awesome bunny. As others have said, be sure he's eating and pooping, those are really good indicators of bunny health. I'm not a bunneh owner so I can't offer advice, just lots of support and prayers. Get better Fats, soon. sent you an email. keep me posted. prayers and good wishes to my fatty boy. such precious, fragile creatures we love. everyone! thank you so very kindly for all this input advice and concern. here's where i'm at with it now. it doesn't seem to hurt him at all. a dermatologist friend of mine was over this afternoon and she looked at and thought that since he didn't seem to be in discomfort around it that it wasn't likely to be a abscess. but she's not a vet so do any of you know if an abscess has pain involved as a symptom? as much of a picker as i am i'm trying real hard not to poke it. instead i've been picking at all the little things on myself! i've started the compresses and neosporin. i will do one more treatment before going to bed and hoping to see some sort of something tomorrow. he's still eating, pooping and playing, kissing and running at full speed all over the place. fats does nothing leisurely. he sprints to his litter box or his water bowl or his food even if it's only 6 inches away from where he was! many thanks and feeling so blessed to have such great bunny loving friends here!
" if an abscess has pain involved as a symptom?" Pretty sure. A previous bunny had a bad tooth that caused an abscess, and he had a hard time eating and lost a lot of weight. He also hated having the area touched. Ended up feeding him baby food, he loved that. My father had an abscess with a tooth too and he said it hurt worse than most things he went through. Not quite sure with other areas that have them, but it doesn't seem something that doesn't cause pain. I wish I could offer more as to what the little bump is and what to do about it, but it sounds like you've gotten some good advice already. Just keep an eye on the spot and on Fats himself, and if you see any changes that don't look right, call your vet ASAP. Good luck! a little fresh air for fats perhaps? in other words mr. gallery boy who doesn't have a rabbit habit, or a bunny, do not make light of fatty's pimple! and besides since my car was taken he has been getting lots of outside run around time. you should see him tearing around the church yard! he's been loving it, but pouts a lot when i bring him in. now go pet your fat cat and send me your friends number. Ohhhh, good luck with Fats! I'd keep up the compresses (my cat has a special kind of acne, and that's what we do for him. I use clean warm wet cloths and press them on his face, and then I gently wipe the bad area, and it really helps clear up the skin on his chin). If Fatty's eating, pooping, playing and having a good time, I would just watch it, but if he appears to be in any pain or discomfort or seems not himself, he really should go to the vet. it's just this weirdy hair follicle that rabbits get them located just underneath the eye, if you check the other side, there will be one there too. you shouldn't have pulled out the whisker really, that is just asking for an ifection. oh my god! anonymous i think you're right!!!! what have i done? FYI, for any bunny owners who may be struggling with abcesses, I wanted to share this bit of information (I don't think I saw it here...). 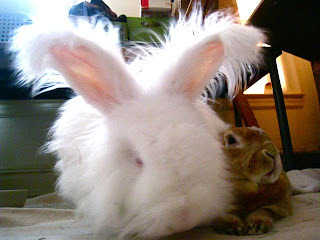 I had a rabbit with chronic abcesses in his jaws, and originally the vet did prescribe oral Baytril, which was useless. I did a bunch of research and emailed the author of "Rabbit Health in the 21st Century" and we decided to use a bicillin protocol which involved two different antibiotics actually injected into the abcess. Worked like a CHARM and far more quickly than any oral meds. I would highly recommend this particular treatment, rather than surgery. My bunny was old and would not have recovered well from that. PS-Adore this site! Your buns are adorable. I hope there is nothing wrong with Fats. it doesn't seem that fats has an abscess. my bun joey has something like that on the side of her face too. she's had it since ever and it has never bothered her, so i never messed with it. abscesses are nasty, and in bunnies, they usually show up in conjunction with malocclusion, which shows up in conjunction with decreased appetite. fats should be ok, just missing a whisker. if you keep applying that hydrogen peroxide, the risk of it getting infected will be pretty low. hai, anon #1 here again, or the one who believed the bump may have been the weirdy hair follice -omg! don't stress I am sure your bunny forgave you muchly after the initial "wtf are you doing pulling my pretty and functional hurrs out? "; you are just being a very attentive mummy. It's rather hard in rabbits to find a balance between adequate care and slightly too agressive care when things go wrong. I know I end up erring on the side of doing too much [caution.as i see it] as opposed to too little when I am worried about one of my little one's. My first proper housebunny, Mimi, had an encapsulated abscess once - the vet offered to operate, but also said that as long as it looked as it did and the bunny did not show any discomfort it would have been more of a cosmetic surgery procedure. When my bunnies had abscesses, and I am talking the type that the vet judged as dangerous and that spread through the body, treatment was done with penicillin injections and it was very effective. Baytril wouldn't have done much to that type of abscess both to Hugo and BillieBun (ATB). Wishing you all the best and sending plenty of healing vibes to Fats - plenty of nose rubs too! Do they ever go away?